Along with Bubu on Long Beach, Ombak is about as close to "international standard" as Perhentian Kecil gets, which is to say, if you’re after a well-sized and well-equipped room and are not fussed about lacking a sea view, then this is a reasonable option. 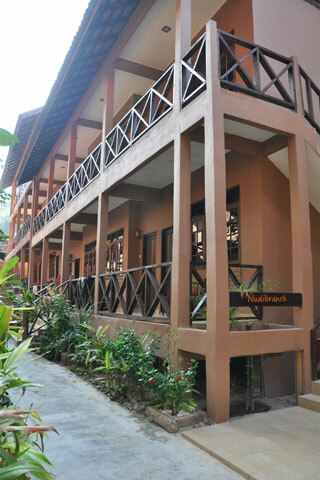 Set in a brown three-storey (it feels towering by Perhantian standards) building with a large attached restaurant (which shows nightly movies) and dive shop, Ombak has a tonne of rooms set in blocks named after various sea creatures running back from the beach. We were shown a fan-cooled and air-con room -- both were spacious and very clean. The air-con had proper beds, while the fan-cooled room had a mattress lower to the floor. The staffer showing us around was keen to point out (on both occasions) the beds have 100% cotton sheets. Bathrooms are clean and hot water and rooms also have a real desk and chair. Terraces are shared and as many face onto the common walkway through from Long Beach, they’re not designed for lounging around on. Rates are higher than what you’d pay on Long Beach most of the time, but so are the standards. If you’re after a hotel standard room, this is a good option. Check their website for packages as the guy just seemed to make up the prices when we asked. Note Ombak also has dorm facilities -- they didn’t volunteer that information to us when we swung by, but we met a traveller as we left the islands who mentioned she stayed in the dorm here -- so if they don’t mention it, ask!